New California-based music LEP innovation company set to democratize stage lighting for performers. 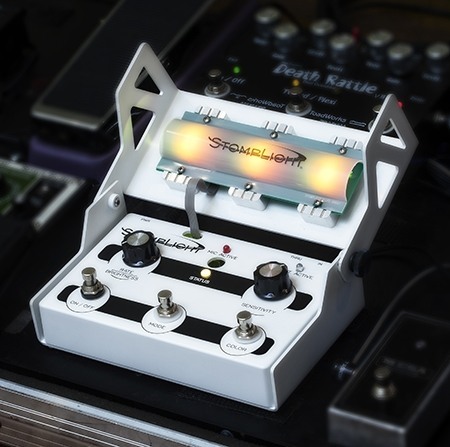 Half Moon Bay, Calif., December 8, 2015 â€’ StompLight International, a pioneering lighting effects pedal (LEP) technology company in the San Francisco Bay Area, announced the availability of their flagship product StompLight. StompLight is a portable unit, small enough to fit onto or by the side of a pedal board, in a DJ booth or as part of any minimalist stage set-up that produces dozens of colorful lighting effects at the click of a button. StompLight is a portable and easy-to-use tool that produces dozens of lighting effects including a color organ mode, Color wheel mode, instrument input mode, and strobe light mode, and houses a built-in microphone with Adjustable input gain that is perfect for acoustic musicians, live bands, DJ’s or responding to house music. Ronny Crawford, drummer and sound engineer for artists like Lisa Loeb and Vanessa Williams. Also ideal for street performers, videographers and photographers, StompLight is a versatile and affordable lighting effects device. Grensta, an on-the-rise DJ and House musician from San Francisco, and rock guitarist James Fraser are also fans of using StompLight for their performances. See these and other testimonials at www.vimeo.com/StompLight Designed and manufactured in California, StompLight will be given its first public outing at the upcoming Winter NAMM show in Anaheim, Calif. in January 2016.